Vodacom released their full-year numbers yesterday showing growth in both subscriber numbers and revenues. - Added 7 million new subscribers to bring the total subscriber number to just over 103 million subscribers. - Net profit grew 18.6% to R15.6 billion, thanks to the proceeds from the IPO in Tanzania and a sale of their stake in Helios Towers Tanzania. This also boosted the group's cash position. 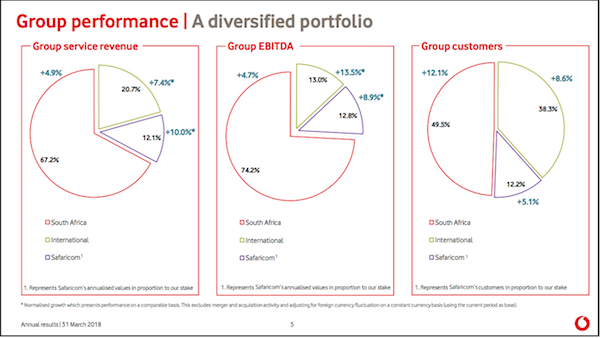 The slide below shows just how important the South African business is to Vodacom. 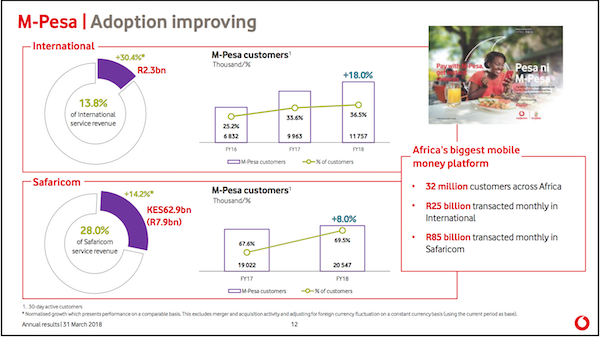 Vodacom's mobile money brand M-pesa is one of the most successful on the continent with over 32.3 million subscribers, and processes over $8 billion per month. Management is excited at the prospect of growing M-pesa in all of their other countries to the same level of sophistication as in Kenya. In Kenya, you can use M-pesa to send cash, pay for goods and services, pay utilities, book flights, convert currencies, receive/pay salaries etc. Below is a slide showing the adoption and penetration of M-pesa in Kenya which is the benchmark for mobile money in Africa. Earnings per share were sharply impacted by the issue of 232 million new shares to Vodafone, when the company Vodacom acquired 34.9% of Safaricom in Kenya. Safaricom contributed R1.5 billion to profit for the eight months that Vodacom has owned the stake. Safaricom will be a solid contributor to earnings going forward as that business continues to grow strongly. Vodacom invested R11.6 billion in expanding their coverage and improving network quality, R8.9 billion of this capital expenditure was in Mzansi. In Tanzania, the company is in the process of acquiring more shares from Mirambo. This transaction will see the group's stake in Vodacom Tanzania rise from 61.6% to 75%. At the current valuation, Vodacom trades at a PE of 16.4, which shows more value than some of the top 40 companies that are seeing no growth. We like what the company is doing with M-pesa and tailored offering on contracts.